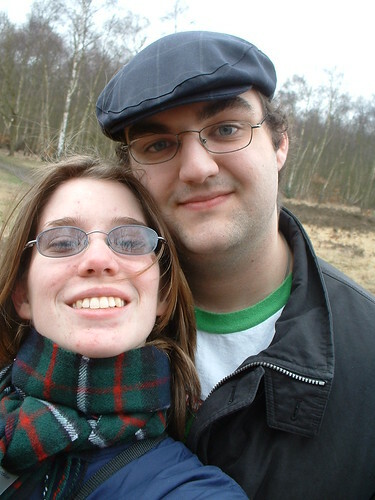 See the nice scarf I’m wearing in this picture of me and Ian at Wimbledon Common in March, 2004? It was brand-new in that picture; Ian gave it to me in when I met him in London after his IQP finished. It’s the Ferguson tartan, and Ian got it on his trip up to Edinburgh. After he gave me the scarf, I hardly wore anything else. It was wool, and therefore a little bit itchy, but it was fabulously warm, great for biking (believe it or not) because it stayed warm when damp, and of course it was very stylish. It kept me warm through 5 Massachusetts winters and I came to be very attached to it. You’ve probably noticed all the past-tense, the way this sounds like a eulogy. That’s because on November 19, I wore the scarf to my AmeriCorps graduation and forgot it at the Hood River Inn. I realized my mistake the next day and contacted the Hood River Inn and the AmeriCorps organizers. The AmeriCorps organizer got back to me and said yes, they found it, and had given it to another intern who lives in Seattle to return to me. Whew, boy was I relieved! I contacted the Seattle intern and we devised a plan for me to obtain the scarf on November 26. He would leave the scarf in his mailbox, and I’d come pick it up on our way to Seaside. Alas, when I got to the mailbox, it was open and empty — no scarf to be found. The intern confirmed that he’d put the scarf into the mailbox… but somebody else, apparently, took it out. I called the post office nearest his house and talked to the carrier on that route. He didn’t see the scarf in the mailbox, and he said even if he had, he wouldn’t have removed it. I have to assume the scarf is gone, and I hope whoever stole it is staying warm with it. It sounds funny that I’m mourning the loss of my scarf, but it’s true. It hurts that I lost something Ian gave me all those years ago, a reminder that he’d thought of me when we were apart and a symbol of my new family name. Then, too, I used it all the time — even in Washington, it was the right weight for many winter days. Also, I’m having a hard time forgiving myself for forgetting it in the first place; for coming up with an idiotic retrieval plan involving leaving the scarf in a public place; for not just waiting to get it back from the intern in person… Goodbye, favorite scarf. I miss you and I am sad that you’re gone. PS – Oh, yes, Ian and I did get back from Seaside. We made excellent time, actually. Yesterday I did all sorts of things around the house, since I haven’t heard from the Bike Alliance on a contract yet (arrrggghh!). Today I have a bunch of errands to do. I can see that if I didn’t have a job, I’d get bored very quickly.